With bold attractive eye-commanding watches designs you won’t forget you’re wearing Moschino watches any time of the day. Unforgettable designer styles led by the latest fashion trends bring Moschino watches to the foreground. Light, comfortable, elegant and feminine Moschino watches radiate with passion desirability and fresh original style. Watches from the Moschino watches Lets Touch Me range are divine to wear. With exquisite attention to detail and leather strap these watches are not just beautiful to look at they are extremely comfortable and durable to wear. Moschino watches come with presentation box, instructions, 2 year Moschino guarantee and many include free UK delivery. As well as the fabulous, glamorous and glitzy Lets Touch Me Moschino Watches also have a funky range called Lets Be Chic and Lets Party! Distinctive watches with feminine hearts, bows and fabulous glittering crystals you’ll feel a million dollars wearing your special Moschino watches. 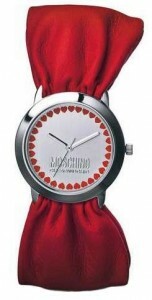 Remember to check out the ladies watches from the Moschino range. This is an Italian designer brand that will look amazing with your latest handbag and shoes, not to mention your Christmas party jewellery and accessories. Watches.org.uk, the UK’s number one watches comparison site, has plenty of Moschino watches to choose from, even for the most discerning of Christmas shopper. Beat the crowds this Christmas and find fabulous ladies watches and mens watches from the incredible choice of over 20,000 watches from your favourite High Street and online stores.